Posted February 21, 2018 by Bob and Jane Kinzie & filed under Backup Generators. Over the last decade or so, there have been millions of people all across America who have been left without power due to natural disasters. 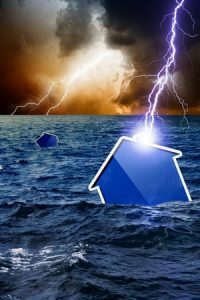 From hurricanes in places like Texas, Florida, and New Jersey to flooding in certain areas in Illinois, the changing climate has wreaked havoc on many homeowners and forced them to spend days, and in some cases, even weeks, living without power. In the event of a natural disaster, a backup generator can absolve any doubt and fear associated with such a tragedy. Hurricanes bring a lot of water with them, but they also bring a lot of wind. That wind is usually to blame for wide scale power outages. The wind can knock down power lines and make it impossible for people to get access to power for days. With a backup generator, you can keep the power coming to your home, even in the event of a power outage in your area. Winter storms can dump inches and even feet of snow and ice on different states throughout the country. This snow and ice can weigh down tree branches and force them to fall and knock down power lines. The snow and ice can also sit on the power lines themselves and lead to power outages. This can be dangerous because winter storms also tend to bring arctic blasts along with them, and the last thing you want is for your home to be freezing-cold in the winter. Outside of being uncomfortable, a cold home can also lead to frozen pipes and flooding in homes. A backup generator can help you prevent these problems. Floods can occur for any number of reasons. In some cases, abnormally large amounts of rain can lead to flooding. In others, melting snow and ice can cause water to overtake a city and lead to flooding. Regardless of the reason, flooding can knock out power and make it tough for emergency crews to reach sites to restore it. In the event this happens, you will be glad you have a backup generator to keep the electricity coming into your home despite the conditions. There are a lot of reasons to consider investing in a backup generator—and there are likely going to be even more reasons in the future. Climate change continues to play a role in the weather patterns in the U.S., and experts predict things can only get worse. Kinzie Backup Generator Systems can reduce the effects experienced during a power outage by providing you with a top-of-the-line backup generator. Call us at 301-469-7800 for more information on the installation process.